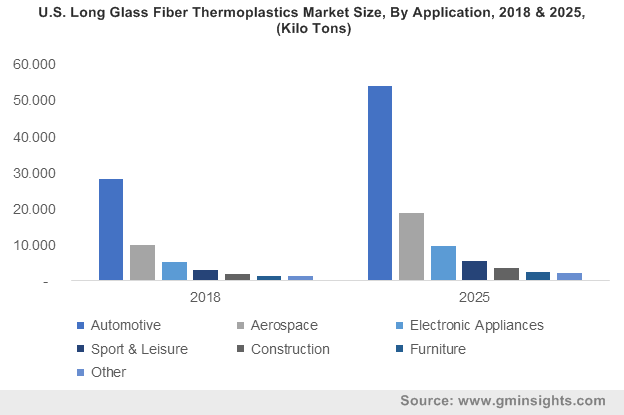 Glass Fiber Thermoplastics Market « Global Market Insights, Inc. The rising focus on the adoption of lightweight material in the automotive & aerospace sectors has accelerated the long fiber thermoplastics market growth in recent years, given the need to attain high fuel efficiency. Long fiber thermoplastics (LFT) help in sustainable development of automotive structures and robust, lightweight aircraft components as well. Indeed, by adopting LFT, automakers and aircraft manufacturers have been able to lower manufacturing cost, reduce installation time, and deliver lightweight components that provide high level of productivity and recycling potential, supplementing LFT market growth. The automotive industry will majorly drive the long fiber thermoplastic market growth over the years to come. The material’s high performance in terms of mechanical properties, low cost, processing advantages and low density has led to its application in the automotive industry for making front end modules, bumper beams, instrumental panel career, doors and underbody shields. The product has an edge over conventional materials like aluminum due to its high specific strength, simple manufacturing process, recyclability, good damping capacity, and corrosion resistance has encouraged manufacturers to implement it in their vehicle segments. Moreover, rising customer demand for fuel-efficient vehicles has also propelled the long fiber thermoplastic industry trends. With increasing emission levels in urban areas along with increased cases of obesity, people are constantly shifting towards cycling to commute in the city, which may in turn increase long fiber thermoplastics market demand. LFT has found application in manufacturing bicycles as it offers frothy properties which ensure better durability, handling and rideability to users. Moreover, as car traffic and commute times at an all-time high, more people are considering cycling as a more efficient and sustainable means for transport. Bike-sharing companies like Lime Bike, Mobike and Jump have recently gained demand from city commuters, generating huge opportunities in the bike manufacturing sector, further augmenting LFT market growth. LFT is rapidly being deployed in the aerospace, aviation and missile/defense applications. The material offers lightweight advantages, design flexibility, high specific modulus and strength, ease of installing, and recyclability. Aerospace components featuring LFT mainly comprise of complex-shaped baseplates for electronic housings, stowage doors, structural load-bearing member and more. These products are utilized for making aeronautic equipments that reduce the weight and bulkiness of an aircraft, eventually making air travel more fuel-efficient and safe. Given the expansive usage of the material in the aerospace & automotive sectors, it is prudent to mention that the Asia Pacific long fiber thermoplastics market, led by South Korea, India, China, and Japan, will accumulate commendable returns in the years to come. China specifically, is predicted to emerge as one of the most lucrative avenues of the regional industry. Since LFT finds long-term applications in the automotive interior manufacturing sector and in the construction of waste treatment plants as well, given its chemical and thermal resistance, China will come up to be one of the most profitable regional grounds for the long fiber thermoplastic industry. As per estimates, China long fiber thermoplastics industry size is likely to record a CAGR of 10.5% over 2019-2025. Another regional ground that is primed to be rather lucrative for the long fiber thermoplastics market is Europe, led by the countries of France, Italy, Germany and the U.K. The region’s automobile industry has evolved rapidly as it comprises renowned auto giant’s like Volkswagen, Mercedes-Benz, Audi and more that offer sales worldwide. The LFT market will also witness significant gains as carbon reinforced thermoplastics are used in the manufacturing of vehicles to reduce kerb weight which makes vehicles more fuel efficient. These thermal & heat resistant components which are largely used in automotive, aerospace and electrical & electronic industries, are lately being amalgamated with carbon and glass fibers to form structures which increase the robustness of a product. This would indeed, give rise to a spate of new growth avenues in the years to come. According to Global Market Insights, Inc., the long fiber thermoplastics market size will surpass $3 billion by 2025. This entry was posted in Polymers and Advanced Materials and tagged APAC Long Fiber Thermoplastics Market, Canada Long Fiber Thermoplastics Market, Carbon Fiber Thermoplastics Market, Europe Long Fiber Thermoplastics Market, Glass Fiber Thermoplastics Market, Long Fiber Thermoplastics Market, Long Fiber Thermoplastics Market 2019, Long Fiber Thermoplastics Market 2025, Long Fiber Thermoplastics Market forecast, Long Fiber Thermoplastics Market growth, Long Fiber Thermoplastics Market report, Long Fiber Thermoplastics Market share, Long Fiber Thermoplastics Market size, Long Fiber Thermoplastics Market trends, polyamide, Polybutylene Terephthalate, Polycarbonate, Polyphenylene Sulfide, Polypropylene, Thermoplastic Polyurethane, U.S. Long Fiber Thermoplastics Market.